It was a sad thing to notice that Psychomanteum broke up a while ago (even though they only short-lived), but it’s a pleasure to see that half of that act, i.e. Robert C. Kozletsky, decided to start an own outfit, called Apócrýphos within pretty much the very same vein. 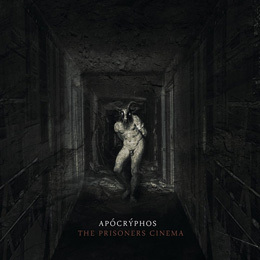 With The Prisoners Cinema, he debuts via mighty Cyclic Law, and it won’t disappoint the fans of Psychomanteum; that’s a promise! The Prisoners Cinema, which lasts for more than an hour, and it represents Cyclic Law’s roster at its best. Eight lengthy cinematic compositions, softly droning and long-stretched sonic adventures through integer and somewhat introvert dimensions, traveling into cold, distant and little scarifying worlds on man’s inner self. I know, this sounds somewhat clinical, but I assure you that this Music is not that surgically clinical at all. The organic ambient atmosphere expresses a conceptual duality, ‘exploring two separate paths that intersect each other through out’, with ‘sensory deprivation, isolation […]’ at the one hand, and a personal approach in which you, as listener, are the prisoner ‘standing alone against your own darkness’. So says the biography, and with this concept in mind, you will surely understand, and ‘enjoy’, this experience. But even without this knowledge, you might adore this fabulous Minimal Ambient / Industrial / Drone recording. At times, the result balances over to schizophrenic initiations (especially towards the end this seems to be the case), then again the nihilism surprises by its perseverance and persuasion. One of the nicest things is the permanently present arousal and tension, which seems to build up as from one third of the experience. I am pretty sure it was meant to be that way, it is on purpose. It’s shadowy and totally doomed-out, with subtle hints of soft-noisy ambience and haunting grimness. And yes, it might be little monotonous, but at the same time it certainly is not either! Fans of Psychomanteum, yet also Treha Sektori, Northaunt and later Desiderii Marginis will adore this bleak yet thrilling Apócrýphos-debut album!